Russian physician; born in Brest-Litovsk 1857. He studied medicine at the University of Warsaw, from which he graduated in 1883. In 1885 he went to Palestine and settled in Jerusalem; two years later he went to Vienna, where he took a special course in medicine. After another short stay in Jerusalem he settled as a practising physician in Odessa, where he still (1905) resides. He is the author of "Mishnat 'Olam Ḳaṭon," of which the first part is a treatise on anatomy, and the second on chemistry; the work has been corrected and annotated by Jehiel Michael Pines (Jerusalem, 1886). 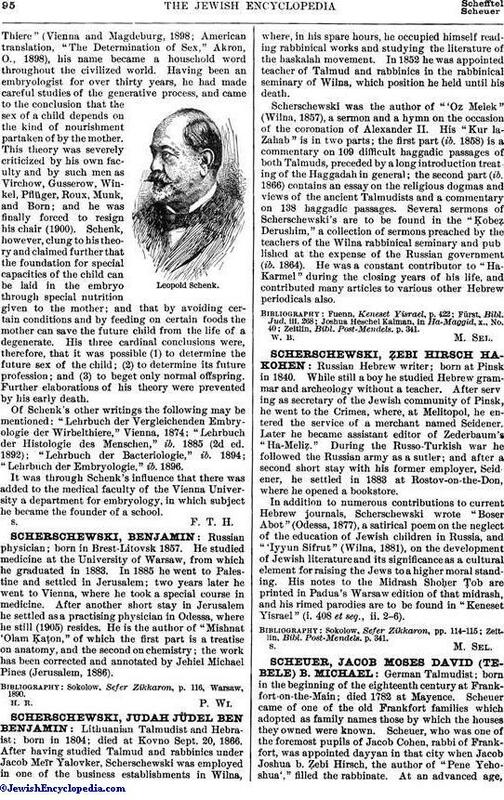 Sokolow, Sefer Zikkaron, p. 116, Warsaw, 1890.